Every parent should get there hands on this book, Its not easy for a someone to express them self especially when negative thoughts become habitual thinking. 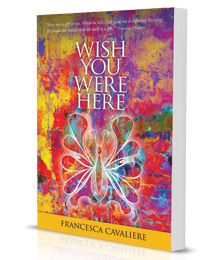 All it takes is for someone like Francesca to raise awareness through this book, and I’m sure she is not stopping there. Its not easy to talk to someone because the person will think of a negative feeling of weakness and not worthy. But something so easy as changing there thinking pattern by telling them that “they are perfect in so many ways, God only made one of you and there is no one out there like you”, or if a person has no idea how to approach this situation, just listening is more then enough. You have my support!! P.S. Simona I love your articles keep up the good work! I am so proud of you mom…you said you would do something to help and you never gave up. I look at you and now believe you when you use to say to me “Lisa if you really want something you can have it!” No matter all the obstacles and negativity you had in your life you always stayed positive…you are true inspiration. This book will make a difference. Words can never describe the immense love I have for you. I know in my heart Tony is also so proud…we are both so lucky to have you as our mother. Forever and ever till the end of time! Francesca, you are one of the nicest person I have met. Along with your husband. I look forward to coming to your book launch on Nov 13th. You are an inspiration, Your loss is great an no words can heal your wound. But hopefully your book will make a difference. Tony is looking down at you with a big smile, I am sure.